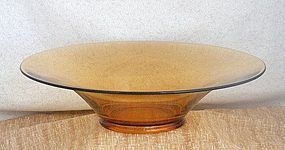 This lovely amber centerpiece bowl is marked with a C in a triangle for the Cambridge Glass Company. The broad flared rim rises from a collar foot showing the fine, rich amber color throughout. It spans 12 3/4" across the broad rim and is 3 1/2" deep. This elegant piece is in excellent condition. 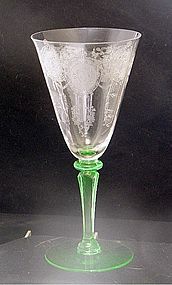 I have other Cambridge and elegant glassware in my inventory... take a peek. Insurance and confirmation are included in the price. 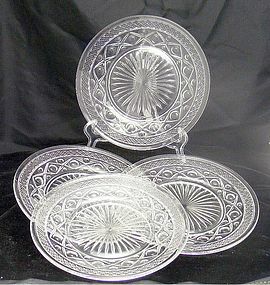 These sparkly lunch or dessert plates measure 8 1/4" across. They feature Cape Cod's pattern of fire-polished optic glass diamonds and thumbprints with a large ray star in the center. Each is in excellent condition and would make a fine housewarming gift. Production dates: 1932-1984. 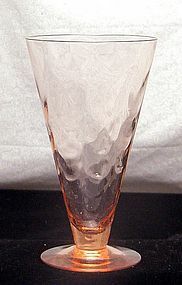 I have other Cape Cod and elegant glassware in my inventory... take a peek. Insurance and confirmation are included in the price. I have 4 sets available... This very sparkly tea cup and saucer shows an optic pattern of diamonds and thumbprints. Each is pressed and fire-polished to make this charming set of crystal glassware. 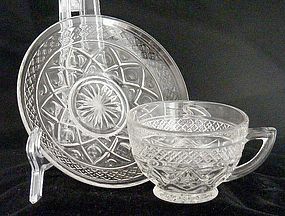 The cup is 2 1/2" high and the saucer spans 5 5/8" across. Each set is in excellent, undamaged condition. Insurance and confirmation are included in the price. This fabulous Morgantown Adonis wine goblet with its green Athena stem is in excellent, unused condition and is quite hard to find. This beauty shows a Grecian flowers medallion with the stylized face of Adonis in its center. This elaborate medaliion repeats three times around the panel optic bowl. This rare wine goblet stands 7 3/8" tall. 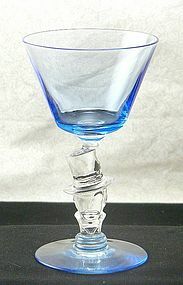 I have other Morgantown and elegant glassware in my inventory... take a peek. Insurance and confirmation are included in the price. This vintage Knickerbocker figurine or novelty stem is by Morgantown Glass from the 1940s. It features a crystal clear stem of man in a top hat wearing a monocle (looks like the Planter Peanut's man.) The flared art deco sky blue blown bowl darkens as it forms the base, that is then attached to the stem. The foot is also blue and is blown, finished glass that is also attached to the clear stem He stands 5 1/4" high and is in perfect, unused condition. Highly collectible. Book value $150. This lovely Anna Rose pink tumbler is by Morgantown Glass in the Peacock Optic pattern. This pattern shows the swirls of color on this delicate glass. It is bell footed and stands 6" tall. It is in excellent, undamaged condition. I have other Morgantown and elegant glassware available in my inventory... take a peek. Insurance and confirmation included in the price.